Nikon makes a number of high-grade super-telephoto lenses, but at just under $9,000 it will come as little surprise to see the highly-regarded AF-S Nikkor 400mm f2.8G ED VR model head this category in optical quality. It has the latest VR II technology (identified externally on the barrel by VR gold-colored paint, earlier VR I models can be recognized by red-paint), but it’s a big and heavy lens to handhold for any length of time. In second place is the equally respected AF-S Nikkor 300mm f2.8G, and although it can’t quite match the firm’s 400mm f2.8 in peak sharpness this model is almost as sharp at full aperture and has similarly high uniformity across the field. Like the 400mm, this model has low chromatic aberration, low vignetting and good transmission. While the 400mm is arguably the most flexible model on account of it high-speed and compatibility with tele-converters, the 500mm is often preferred as the best all-rounder. It’s superb performer optically, but the AF-S Nikkor 600mm f/4G is slightly sharper at wider apertures and comes in third-place in our rankings, just ahead of the 500mm. At close to $10,000 it’s not for the faint hearted. Included in our rankings this time are two versions of Sigma’s stabilized 120-300mm f2.8 DG OS HSM S series lens, the recently updated model and the previous iteration. With over half the range of a 70-200mm f2.8, and at around 60% of the price of the Nikon AF-S Nikkor 300mm f2.8 the Sigma is a tempting option. Although the new model has the same optical construction as its predecessor, some improvements in image quality were measured though peak sharpness hasn’t improved. 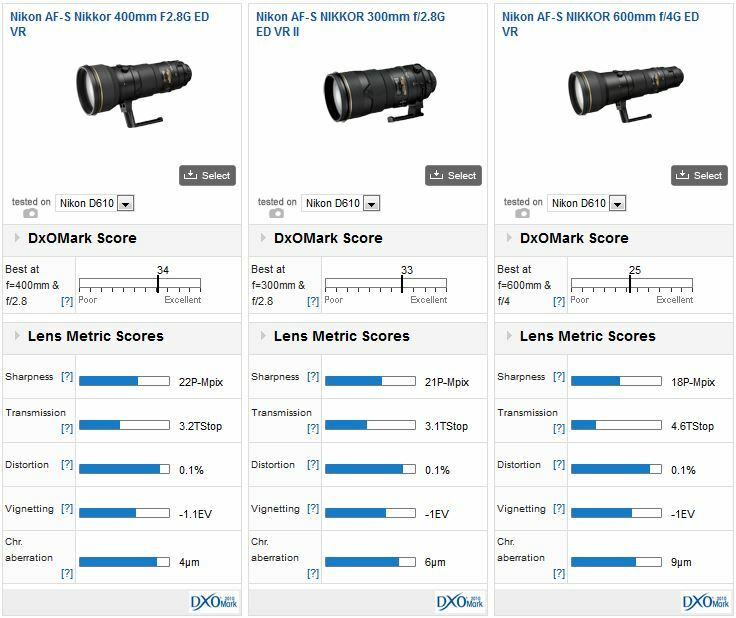 Nikon’s AF-S Nikkor 200-400mm f4G ED VR II has also been analyzed and while the Sigma has higher peak sharpness, it doesn’t have the corner sharpness of the Nikkor at f4-5.6 over the 200-300mm range. The Nikon is also an excellent performer at 400mm but it’s still not in the same league in sharpness as the firm’s AF-S Nikkor 400mm f2.8G ED VR. Smaller and lighter than the Sigma and Nikon 200-400mm, the new AF-S 80-400mm f4.5-5.6G ED VR is another model with good optical quality and although it’s sharper at the shorter end it still has good center sharpness and negligible chromatic aberration where it’s likely to be used most, wide-open at 400mm. At $2,700 it’s not inexpensive but it’s more accessibly priced than the faster, more specialised models. 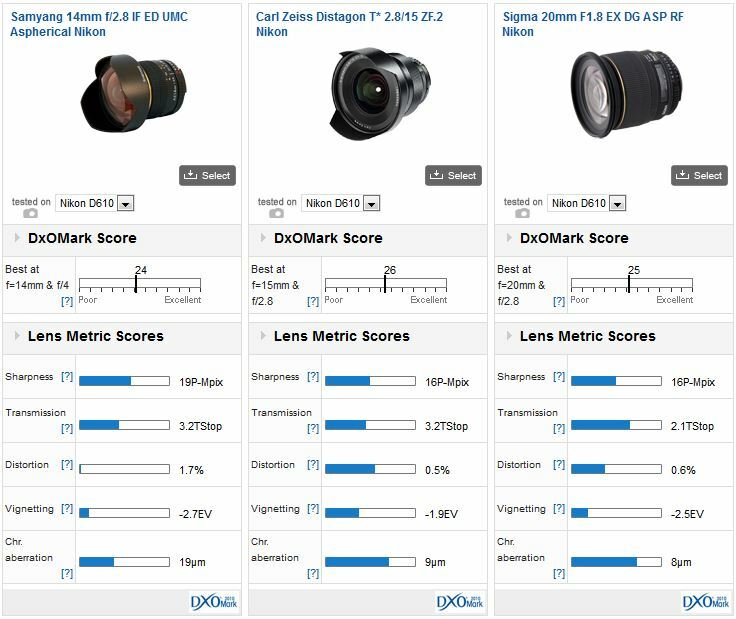 Sigma’s 35mm f1.4 DG HSM A model is the best performing wide-angle lens on the D610 and with a DxOMark score of 38 points and a representative 20P-Mpix Sharpness rating it’s a slight improvement over the earlier D600. 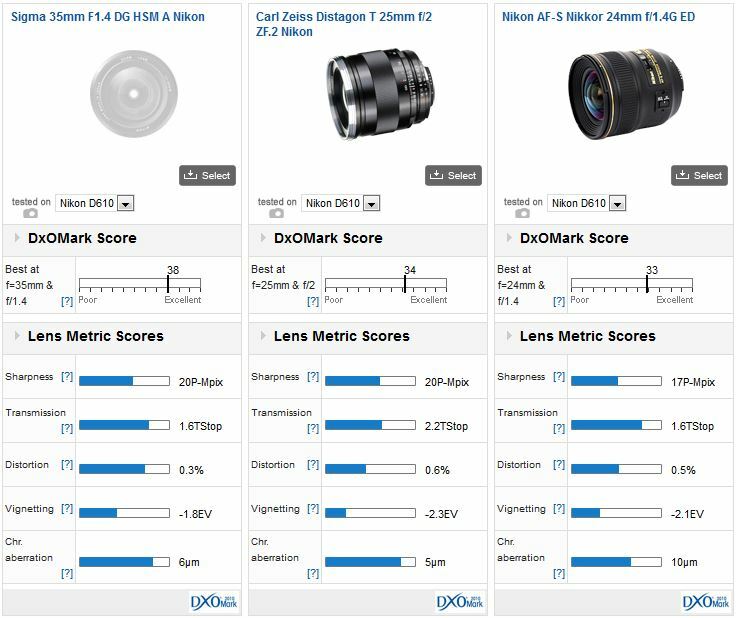 No other 35mm lens model can challenge the Sigma especially at wider apertures but the Zeiss and Nikon equivalents come close in terms of peak sharpness. However, both those come with a hefty price premium. Best value has to be the Samyang 35mm f1.4 AS UMC at $599, it’s a third of the price of the Zeiss or Nikon. It a very good optical performer but it can’t quite match the Zeiss or Nikon at the initial aperture but it is comparable when stopped down one stop. It also has a bit more distortion but control of CA is impressive. New ultra wide prime designs fare less common today than they were in the film era, and Nikon has had little need to do so since the introduction of the AF-S Nikkor 14-24mm f2.8G ED but there have been a couple of notable exceptions from third-party makers. Zeiss introduced a Distagon T* 2,8/15 model for Nikon (and Canon) DSLRs and at $2,950 comes as little surprise to see it head this category. 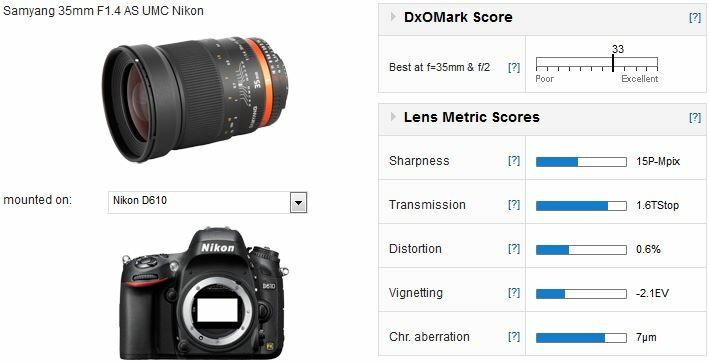 On the Nikon D610 the Zeiss even performs marginally better than on the Nikon D600. Samyang’s 14mm f2.8 IF ED UMC is another excellent performer, and even its manual focus design doesn’t detract at this focal length. It has phenomenal central sharpness at full-aperture but it has stronger, more noticeable field curvature than the Zeiss though the performance across the field improves when stopped. Chromatic aberration is also rather high but at $409 the Samyang is a bargain. The Zeiss Distagon T* 2,8/21 never fails to impress but at a third of the price, at $629, the Sigma 20mm f1.8 EX DG ASP RF is notable for its large aperture design and high image quality and excellent sharpness. It also has very low chromatic aberration, which is very unusual in high-speed wide-angle design like this. The reason why Nikon hasn’t rushed to improve some its older ultra-wide fixed focal length models is due to the phenomenal AF-S Nikkor 14-24mm f2.8G ED. Even the Zeiss Distagon T* 2,8/15 prime struggles to match the Nikkor at 14mm in sharpness though it can’t match the Zeiss in its correction of distortion and chromatic aberration. Even so, at $2,000 the Nikkor lens is still considered to be excellent value, and its flexibility means that’s often chosen for architecture and interiors over the firm’s PC-E Nikkor 24mm f3.5D ED model (though that could change should Nikon ever introduce an 18mm with perspective control in the future). If the extreme field of view isn’t crucial, the firm’s recent update to the more modest 18-35mm f3.5-4.5 model is an excellent performer on high-resolution DSLRs, especially at the wider-end where it compares in sharpness with the AF-S Nikkor 14-24mm f2.8G ED. Chromatic aberration is similar at 18mm but distortion is higher and vignetting isn’t quite so well controlled either. Still, this model’s small size and compatibility with filters is promising. 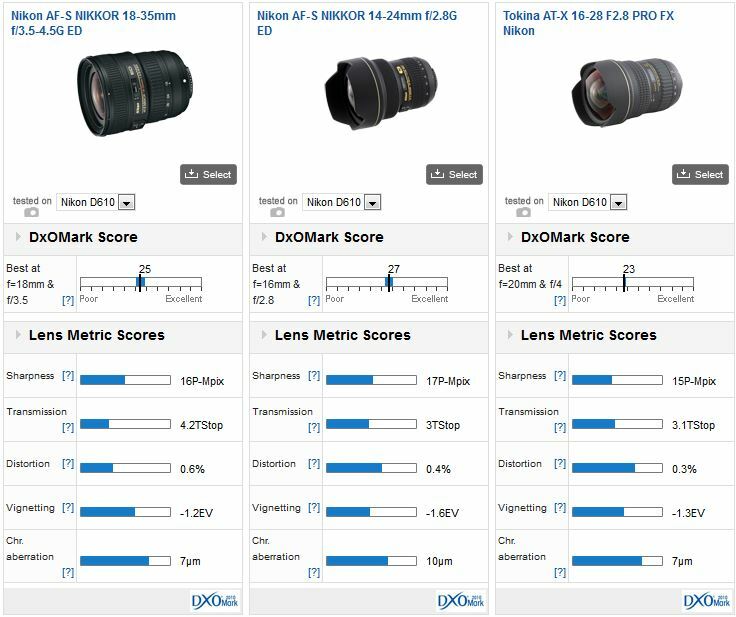 In third place is Tokina’s 16-28mm f2.8 Pro FX. 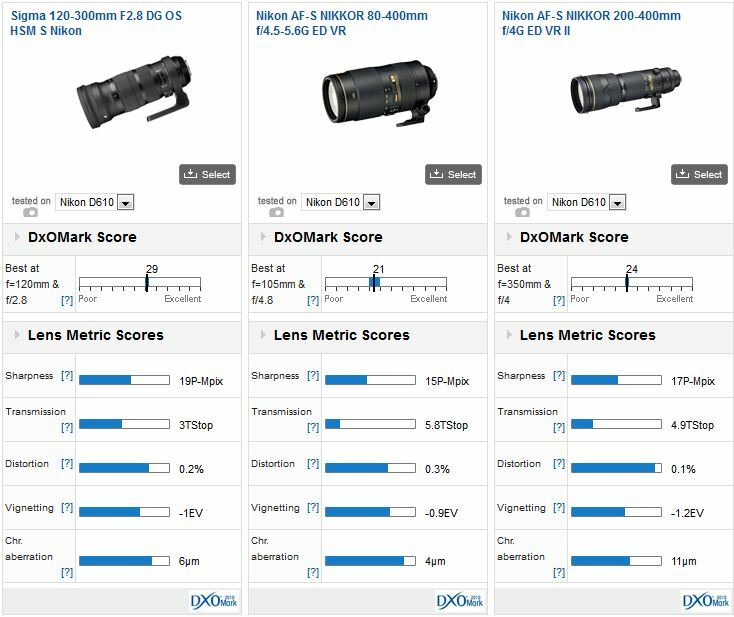 It’s a good performer generally but full aperture performance is behind both the two Nikkor models. Center sharpness is good at 28mm wide open, but this lens needs stopping down to f8 for edge-to-edge sharpness. Unfortunately, like the AF-S Nikkor 14-24mm f2.8, the bulbous front element and built-in petal-type sunshade means attaching filters is tricky. 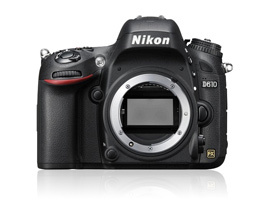 If you have a Nikon D610 and a favorite lens, we would very much like to hear from you. Please leave a comment below, stating what lens it is and why you like it.